Traditionally, when we think of condiments, we think of mayo and mustard—they're standard, classic sandwich toppers. Today, the condiment options are much more robust. From flavored mustard to a plethora of barbecue sauces, the options are plentiful and probably a bit confusing. In addition to toppers, condiments are used in cooking to marinate, tenderize protein, boost flavor, and add an appeal to the palate. While most condiments don't provide much nutrition to your diet, some do contain healthy ingredients such as herbs, spices, ​heart-healthy fats, and antioxidants. But, regardless of whether you choose a healthy or not-so-healthy condiment, it's usually wise not to drown your food in it. Instead, stick to the serving size. 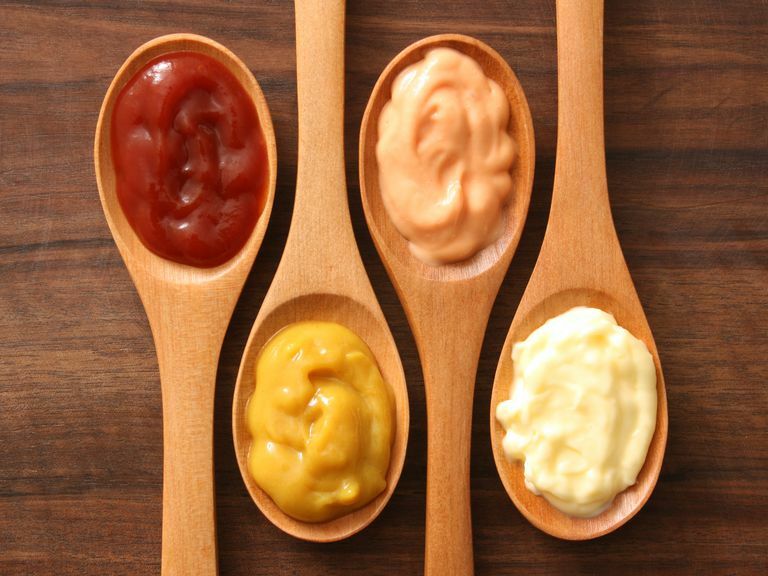 The condiments that made it to the healthiest list are those that are low in calories and unhealthy fat and those that are made with quality, less processed ingredients that contain health benefits. Mustard is a very low calorie (only 5 calories in one teaspoon), carbohydrate, and fat-free condiment that can serve to amp up the flavor of food by adding a spicy kick. Most traditional mustards, both yellow and spicy, are made of distilled vinegar, garlic powder, mustard seed, onion powder, salt, spices, and turmeric. This means that mustard contains negligible calories, fat, protein, and carbohydrate in one serving. In addition, studies have shown that turmeric can have health benefits. Turmeric contains a compound called curcumin. Preclinical studies suggest that curcumin can act as an antioxidant and has anti-inflammatory, anticancer, and neuroprotective properties. Flavored mustard, such as ​honey dijon can contain added sugar, therefore, make sure to always read the label before eating. Whether balsamic, white wine, or apple cider, vinegar can be used to top sandwiches, dress salads, side dishes, and marinate foods. This condiment is virtually calorie-free (ranging from 0 calories to 10 calories per tablespoon) and contains no sodium. Studies have shown that apple cider vinegar specifically can reduce fasting blood sugar in people who are at risk for type 2 diabetes. Hot sauce, including original Tobasco and Sriracha sauce, is made from red chili peppers, which give it its spicy flavor. Adding spice to your food can be satiating and help to curb your appetite and possibly speed up your metabolism. Read labels before pouring, as Sriracha can contain sugar. Try topping your egg scramble, vegetables, or whole grains with a dash of hot sauce. This low calorie, low-fat, tasty and nutrient dense salsa can zest up any meal. Traditionally made with tomatoes, onions, jalapenos, and lime, you can easily make your own to save on sodium. Top your salad, vegetables, or protein with this to add flavor. Or, simply dip fresh, raw vegetables in it as a snack. This one was a toss up for me, clocking in at 20 calories, 5 grams of sugar, and 4 grams of carbohydrate in one tablespoon. Because of its carbohydrate and sugar content, ketchup is a condiment that needs to be portion controlled, especially for people with diabetes who are following a modified carbohydrate diet. However, if you can stick to one portion and choose a type of ketchup that is not made with high fructose corn syrup, then it can be included in a healthy meal plan, particularly if you are replacing a higher calorie item such as creamy dressing or sour cream. The items on the unhealthiest pick list are high in calories, sodium, fat, and/or sugar for a small serving. If you use these items frequently, you may want to cut back and try replacing them with one of the condiments on the healthy list. Creamy salad dressing made with added sugar, sour cream, mayonnaise, and egg yolks is rich in calories, sugar, and saturated fat. A small serving can tack on a ton of calories. For example, as compared to a vinaigrette dressing, two tablespoons of store-bought creamy Caesar dressing contains 170 calories and 18 grams of fat, as compared to 90 calories and 9 grams of fat. The main reason mayonnaise is on this list is because it is extremely high in calories for a small portion. Although it is made from whole ingredients such as egg yolks, olive oil, and vinegar, one tablespoon of mayonnaise can cost you 100 calories and 11 grams of fat. And while much of the fat is unsaturated (the healthy kind), it can be hard to portion control this condiment, which can lead to excess calorie intake. If you are looking to manage your weight, then mayonnaise is an easy ingredient to omit from your diet to reduce your overall calorie intake. Replace mayonnaise with mustard when topping sandwiches and use a small amount of avocado or hummus instead to make tuna or egg salad. Barbecue sauce is moderate in calories, containing about 60 in two tablespoons, but it also contains a large amount of sodium and sugar in one serving. Most brands range from about 10 to 13 g of sugar (equivalent to 3 teaspoons of sugar) and 280 to 350 mg of sodium. Another issue with barbecue sauce is that most people don't adhere to the serving size, which is two tablespoons. So, if you are trying to watch your calorie and sugar intake and are going to use barbecue sauce, aim to stick to one serving. The calories and fat in sour cream can add up quickly. With 60 calories and 5 grams of fat in two tablespoons, this condiment is one that can likely put you over your calorie budget. In addition, about half of the fat in sour cream is saturated. A diet rich in saturated fat has been linked with heart disease, high cholesterol, and diabetes. If you are looking to find a good substitute for sour cream, try a tablespoon or two or low-fat or non-fat plain Greek yogurt. The tangy flavor will suit your craving and as a bonus, you'll get more calcium (which is good for your bones), as well as more filling protein.